The latest part from the trilogy starts pretty well, but later it just becomes a long and boring moral lesson about racism. The beginning of the book is pretty funny: four people passed nine years on the alien planet. Now three of them arrived back to Earth in Themis, actually landed in Russia, where a funny agent makes interviews with them. There are two story-lines in the book: one about their present in Russia and one about their past on the alien planet. In the present, there are serious problems in Earth: USA became a conquering and oppressive power using Lapetus (the remaining robot in Earth), so it could be real turn when Russia takes his hands to Themis… But who will drive Themis for them? Would they force Vincent to fight for Russia, against the diabolical Americans? Another serious issue that humanity as a whole started to fear the aliens. As we learned, some people have alien DNA, so countries lock them up in camps, which is a clear reference to the holocaust (except they didn’t kill these people – yet). The other storyline is about the alien planet, where the aliens does not have hair on their body, but except this, they are essentially the same as humans. They have shops, they have an empress, and they have different kind of people too… As the parallel story goes, we see that their society is very similar to ours: they are racist, they are corrupt… So the four people faces similar problems that on Earth. They have many, actually too many “personal log entries” in the book about their thoughts on racism – the book is full of boring, moralizing monologues. There’s another storyline between dad and daughter as well, but that’s also not too interesting: it’s always hard to be with teenagers. So instead of an exciting sci-fi based on alien mysteries, we have a boring, moralizing book with an unrealistic story. How the Russians just leave Rose to go home? How can the most important prisoner of the world just escape from the prison? 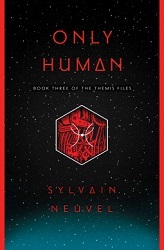 There’s no mystery, there’s no interesting technology, the aliens’s morality is the same as ours, the only exciting character died in the second part, so what remained for the readers are the many long monologues about racism – I hoped for a more exciting end for the trilogy.